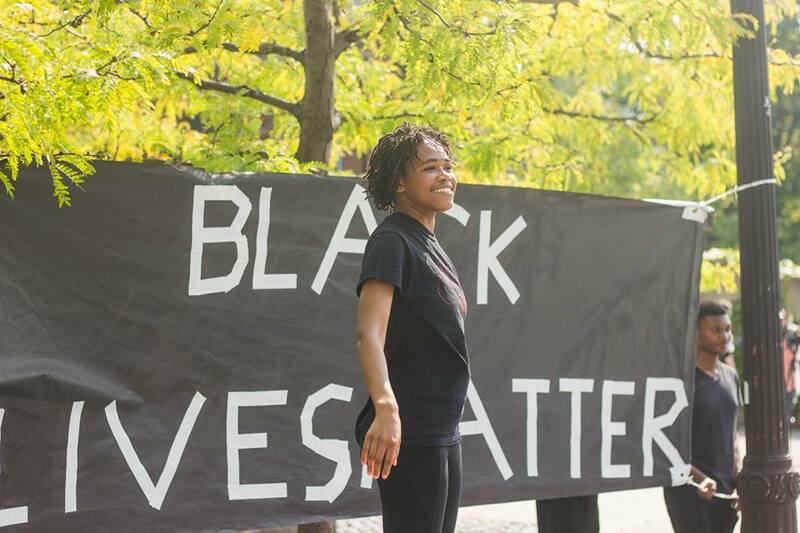 This post is an amended version of remarks read at a rally organized by Cornell University’s Black Students United (BSU) on September 23, 2016. 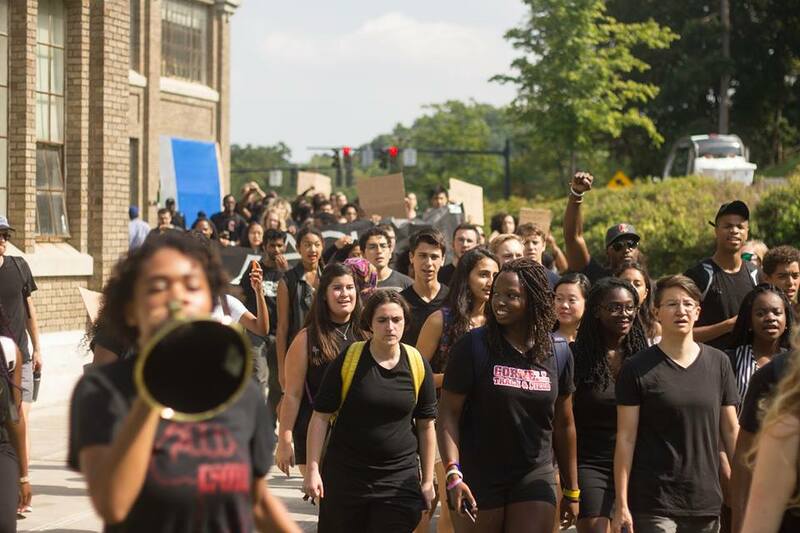 Students gathered to protest the recent police shootings of Tyree King, Terence Crutcher, and Keith Lamont Scott. This article originally appeared on the website of the African American Intellectual History Society. This story and its photos reappear here by their kind permission. I’m delighted that you are mobilizing. Your demonstration reflects your recognition that the escalating crisis of racial terrorism requires a firm and uncompromising response. Your protest in the face of daily atrocities is a sign of your humanity and your determination to live in peace, freedom, and dignity. But as we demonstrate, we must take pains to avoid certain tactical and programmatic errors that often plague progressive protest in a neoliberal age. Let’s examine these fallacies: Sisters and brothers, YOUR opposition to racist state terror is a major threat to the normal functioning (and thus the hegemony) of the neoliberal regime. To neutralize this threat and destabilize the most rebellious segments of the population, the corporate power structure aggressively propagates certain false assumptions among the public. The managers of the status quo hate resistance. So they try to guide any dissent that arises into “safe” channels. You will notice a proliferation of forums, discussions, and meetings organized by system administrators and devoted to “dialogue” and “awareness.” The premise of such efforts is that the problem of racial unrest stems from misunderstandings among rational and well-meaning parties. Thus communication and moral suasion—rather than pressure politics—is the answer. In our technocratic society, we are conditioned to believe that experts and officeholders hold the answers to social problems. Supposedly these professionals are able to mediate between contending groups and interests. We are taught to endlessly petition established authorities for relief, never realizing that such gatekeepers are themselves instruments of the status quo. Part of capitalism’s response to grassroots opposition is to assure the distressed that their “voice” is heard. That the authorities who “hear” you also enable your brutalization is immaterial. The point is to convince you of your continued stake in the system. It is to guide you toward the politics of representation and away from the politics of resistance. Of course, there are other fallacies employed by the oppressor to confuse the oppressed. The fallacy of inclusion v. transformation, for example. Or the fallacy of “diversity” v. genuine antiracism. We are taught to be patriotic, to be patient, to strive to embody the very values of peace and goodwill that this society defiles. These and other myths only perpetuate the system. They leave intact our society’s basic power relations. And they cause us to police ourselves and to seek interpersonal reconciliation rather than confront structural racism and oppression. Truth is, we don’t need “diversity” training. We don’t need focus groups. We don’t need consultants and experts. We don’t need the apparatus of our oppression—racial capitalism itself—to rationalize and regulate our dissent. The logic and techniques of the corporate world won’t end the slaughter of black people, or the dispossession and degradation of indigenous people, or the transformation of the entire Global South into a charred landscape of corpses and refugees. We need an uncompromising, multiracial, grassroots movement against white supremacy, endless war, and vicious corporate capitalism. We need to build solidarity with the resistance in Charlotte, Standing Rock, and Puerto Rico. We need to join the rebellions of workers and the colonized all over the world. This is a human rights struggle. And it will be waged in the streets, not in boardrooms, the halls of Congress, or other strongholds of global capital. Russell Rickford is an associate professor of history at Cornell University. He is the author of We Are an African People: Independent Education, Black Power, and the Radical Imagination. A specialist on the Black Radical Tradition, he teaches about social movements, black transnationalism, and African-American political culture after World War Two. Follow him on Twitter @RickfordRussell.